Pros: An interesting and often acrobatic performance with a clear purpose. 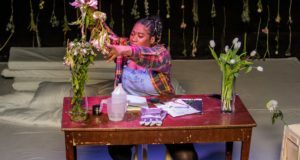 Cons: It is debatable whether Escape‘s execution lives up to the show’s outstanding artistic vision. Escape provides a surprisingly deep statement on and harrowing interpretation of the theme of escaping. The Blue Elephant Theatre is a charming hidden gem in South London. 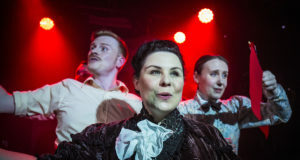 It’s well off the beaten path but helpful road signs are available to guide you, whether in car or on foot, to this quirky oasis of a theatre with an interesting collection of – you guessed it – blue elephants surrounding its small but cheerful bar. The stage for this production is set with large sheets of clear plastic draped from the ceiling, with a woman lying within the folds of the sheets and a strange metal structure in the background. I worry for a minute that I’ve wandered into CSI: Southwark, but once the show starts, my fears are eased. Both the plastic and the metal structure (which turns out to be for aerial swings) form a vital part in exploring the ideas of escapism that the production considers. Choreographer and dancer Joanna Puchala has created a multi-media dance theatre piece that incorporates video, music, acrobatics and dance. The piece works around the theme of escape and is initially quite calming and soothing as the audience watch and hear the sounds of the ocean and water. This is an interesting point to remember when watching the performance’s conclusion. The aforementioned plastic and aerial swings work in turns to provide instances of breaking free and breaking out of a confined area. The performance is engaging and reminiscent of the transformation from chrysalis to butterfly, however I wonder if it isn’t a little rough and ready and in need of some more polishing. Although Escape is incredible to watch when the dancing is deliberate and considered, there are times when the two dancers don’t seem in sync and I couldn’t help but wince whenever I saw a foot smack into one of metal poles on the stage. The show features awe-inspiringly clever and absolutely mesmerising scenes, such as the transformation of one aerial swing into a beating heart. Similarly, scenes where Puchala is enveloped in one aerial swing whilst in a split of sorts are tremendous and I find myself wishing the production capitalised more on these stunning moments. The twist in the show’s context at the end is shocking and moving. Do not make the mistake of thinking the concept of ‘escape’ is interpreted in this production in an Eat, Pray, Love fallacy of entitlement and that freedom is to break away from ‘first world problems’. The ending of Escape is far deeper and inspires a tremendous amount of reflection and sobriety in the audience as they exit the theatre. Puchala’s vision is a creative and noble one, and it’s extremely important not to take this production at face value.